The 1st of the RadiOblivion Band Showcases brings you France's very own top sand-stompers Les Arondes! The boys stopped by the virtual studio after a band rehearsal to spin some tracks and tales about the band, as well as the burgeoning music scene in France. We played 4 tracks off their brand new LP "Kahlua", a few off their 4 song 7" EP, and a slew of live tracks - including the audio from two videos recorded at the Surfer Joe Summer Festival by Unsteady Freddie hisself! Join the shindig via your computer machine or mp3 playin' device of choice, and see why Michael Kaiser sez: "Les Arondes are thee greatest moderne Surf band on this, or any other beach, baby!" 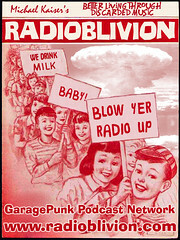 And tell 'em you heard 'em on RadiOblivion! Also, for some of the best Surf music videos on the interwebs, check out Unsteady Freddie on YouTube.